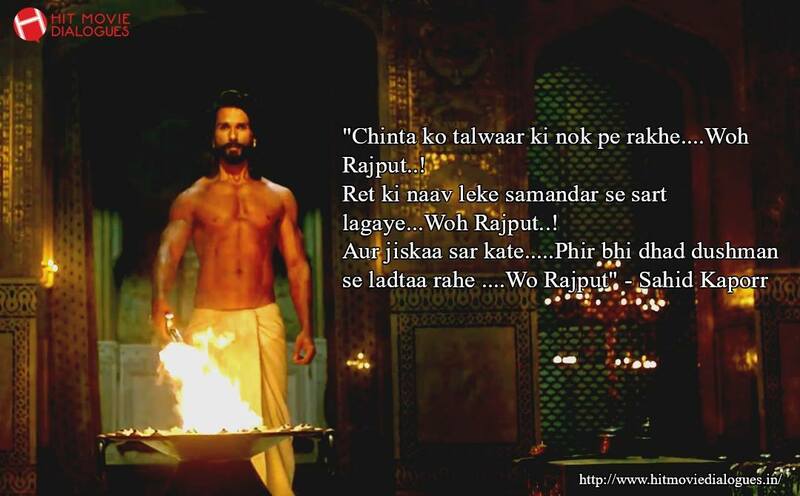 Hello Guys We sharing some best dialogues of Padmavati movie which are delivered by Sahid kapoor & Ranveer Singh. The long-awaited trailer of the film was launched on Monday. The trailer is really awesome. This is an historical drama movie which is directed by Sanjay Leela Bhansali & produced by Bhansali starring Ranveer Singh, Sahid Kapoor. The film is based on the legend of Rani Padmini a legendary Hindu Rajput queen, mentioned in Padmavat. According to Padmavat, she was the wife of Rana Rawal Ratan Singh, the Rajput ruler of Mewar. Deepika is playing main lead role of queen Padmavati and Sahid Kapoor portraying character of Ratan Singh and Ranveer Singh appeared in Negative character role as Alauddin Khilji. Aditi Rao Hydari is also playing important role. Here we sharing some hits and famous dialogues from Padmavati. This film releasing on 1 December 2017. All Fans are really very excited for this film. Chinta ko talwar ki nok pe rakhein....Woh Rajput..! Ret ki naav leke samandar se sart lagaye...Woh Rajput..! Aur jiskaa sar kate.....Phir bhi dhad dushman se ladtaa rahe ....Wo Rajput..!